I almost forgot to post this recipe because the cookies I made this weekend are long, long gone by now. But before we start, let me say thank you again for all of the lovely comments y’all always leave me. I like reading them even though I don’t always respond, and I appreciate them. To those of you who wrote to me asking whether the patterns that had been on the Adorn website will be available anywhere else, I regret to inform you that the publisher has no plans to host them anywhere. Sad. Any further questions should really be directed to customer service, since I am not really equipped to handle them. But thanks for asking– it’s nice to know we were loved. Now, on to the cookie! I used a recipe I found here, which is a modified version of the Magnolia Bakery recipe. I further modified it –I used all white sugar, having no brown, and added extra peanut butter and chocolate chips since I didn’t have peanut butter chips. I am sure it is excellent just as is, and I’m going to re-post it here for my (and your) easy reference. In a large bowl, beat the butter and the peanut butter together until fluffy. Add the sugars and beat until smooth. Add the egg and mix well. Add the milk and the vanilla extract. Add the flour mixture and beat thoroughly. Stir in the peanut butter chips. Place sprinkling sugar on a plate. Drop by rounded teaspoonfuls into the sugar, then onto ungreased cookie sheets, leaving several inches between for expansion. Using a fork, lightly indent with a crissscross pattern (I used the back of a palette knife to keep it smooth on top), but do not overly flatten cookies. Bake for 10 to 12 minutes. Do not overbake. 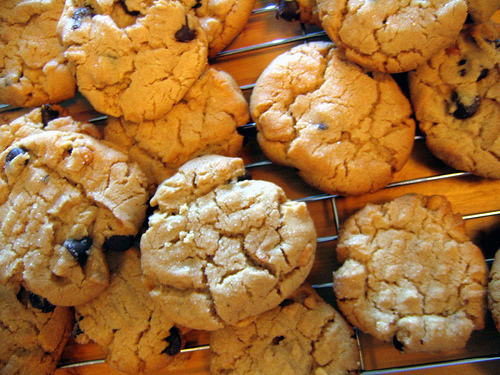 Cookies may appear to be underdone, but they are not (Linda’s note: this is true). WARNING: The recipe made 32. 26 of them were gone within 2 days (I froze the rest, although next time I’ll freeze the dough so I can bake them fresh). I’m just saying. i'm getting questions too...it really is too bad.